On August 13th 1999, whilst counting adult Common Blues in a colony near Kersall - I saw what was strongly suspected at the time, a Brown Argus. Apparent lack of any blue and distinct orange spots bordering both hind and forewings helped in my suspicions. Although very familiar with the species (from unsuccessful captive breeding attempts with Brown Argus in the 1980's) I wasn't able to clinch the identification as the views were brief and mostly in flight. The butterfly was soon lost from view and because of the uncertainty, the record was withheld at the time. Subsequent returns to the site at the first opportunities, failed to find any further adults and the record was considered a possible "one off", although nagging suspicions of perhaps a fragile population at the site remained throughout the Winter and the following Spring. With the apparent recolonisation by the Brown Argus at several sites in Nottinghamshire, I vowed to conduct a very thorough search of suitable habitat within the recording area during the flight periods the following year, in an attempt to ascertain the species' presence. On the afternoon of June 16th 2000, a visit to the area where the suspected sighting was made, revealed that no adult Common Blues or any possible Brown Argus were on the wing, despite the sunny and warm weather conditions. The first male Meadow Browns were in flight, but otherwise nothing else. 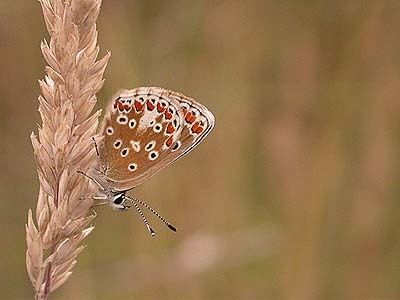 A proposed photographic stop at another area, revealed a previously undiscovered Common Blue colony. It was here, that whilst photographing a male Common Blue, I noticed again an adult Brown Argus. The butterfly sat openly feeding for several minutes before flying off, but wasn't relocated despite a quick search. Abdomen shape revealed the butterfly was a male and in perfect condition. Confusion with adult female Common Blue here is minimal. Despite considerable variation in the amount of blue colouration within females of the species and the presence of orange spots on the edges of both hind and some forewings of females noted here, lack of any blue colouration is often immediate and quite distinctive at first glance. Adult Brown Argus are quite distinct once seen. A very thorough search of the area was conducted during the following days, unfortunately proving fruitless and it was assumed that any chance of photographing the Brown Argus, would have to wait until the second flight period in August. It was an assumption that was to prove correct. On August 23rd, 2000, the Brown Argus was again recorded. Searches of the areas in which the species had been seen, were by now either mown or extremely well grazed. Both sites drew a blank and it wasn't until a visit to the Oil Bore Holes area of Eakring village, that the Brown Argus was again found and photographed. This new site was the third in which the species had been seen and again confirmed the spread of the Brown Argus within the recording area and county. Despite some survey work to ascertain any viable Brown Argus populations during the two flight periods this year, no adults were recorded. That does not mean to say that the species has failed to gain a foothold here and work will continue over the coming years. Following several surveys of suitable sites in the area, the Brown Argus was finally re-discovered on August 8th along Mill Lane near Eakring village. The site is designated as a SINC site, is flower-rich and undisturbed. Three adults were also found at Eakring Meadows a few days later on August 13th and 14th. Other sites where it had been observed previously (with the exception of the adjacent Oil Bore Holes) are either heavily grazed by sheep and cattle or cut for hay in mid-July. The Brown Argus seems to require areas of short grass or pockets of sparsely vegetated open ground. 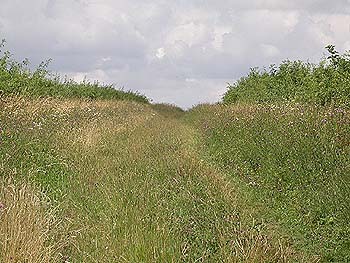 Mill Lane (pictured left) provides such habitat through it's common use as a public footpath and farm track during the Winter months, but is equally likely to be encountered in areas of rank grassland, such as that found to be holding at least three adults at Eakring Meadows after mowing. Seperating the two species can be difficult. At Eakring, most females Common Blues are distinctly blue and confusion with the Brown Argus is unlikely. This is not so in other parts of Nottinghamshire where females are very similar to the Brown Argus. The key to seperating the two, is in the positioning and number of spots on the underside of the hindwings. 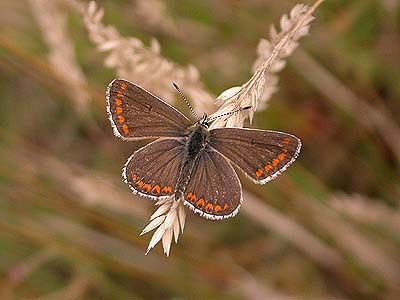 When at rest, Brown Argus butterflies show a brown background colouration, identical to that of female Common Blues. Male Common Blues have a decidedly grey background colour to the underside of the forewings.